“Under the Influence,” by Frank Viva. Hey kids! 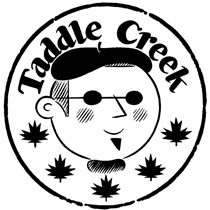 This issue of Taddle Creek is just for you! An excerpt from Jake and the Giant Hand. While other kids play video games, Cole Fleming rides the rails and explores his city. Not all eastern grey squirrels are grey! I Ain’t Racist, But . . .
Dave DeVries’s Monster Engine helps kids discover the power of their imaginations.